This Hot Rod was some wild ride. It was always a race car until I sold it. I don't know where it is now. Those ladder bars would be a dead give away. I had a 350 small block with a turbo 400 and a 488 spool. The wheels are Rocket wheels and in those days to drive it on the street you had to smog it. You can see what it looked like after I sold it the second time. I had a '65 hardtop LEMANS, a '65 sedan Lemans, 2 convertible '64 LEMANS', one of which I made into a '65. I think this is the best size of car, and the interchangability is amazing. What a cool car! Maybe the current owner will post it on this website. How fast did that car go, anyway? I'll bet it smoked the competition. I never raced it, it was one wild ride though. 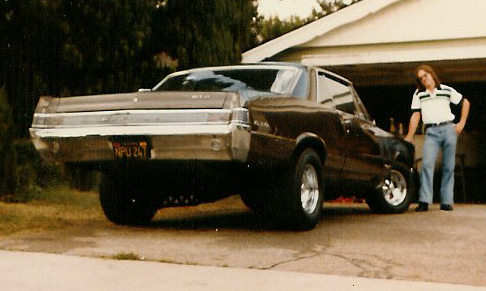 When I bought the 65 GTO, they were common and it didn't have an engine or trans. As soon as I installed an engine I sold it to a mechanic, then he got it running. He couldn't pay for it and I took it back. Then a guy came up right after this PIC was taken, gave me an offered. He also didn't finish paying, (bad check) I couldn't get in touch with him again. Then I saw it at this impound yard quite a while later. Not very exciting I know. I had at the same time 2 64 LeMans convertibles and another 65 LeMans hardtop. I think I had about 10 other cars, you could get cool cars for $100 at the time. I didn't have any more room and at the time they were everywhere. Neat old pics. The 65 is probably the best looking GTO body IMHO. You say you never raced it, but the modifications to this one certainly made it look tough. I bet it was pretty fun. It was fun, but with the 4.88s, driving around was limited. I loved the way it looked, at the time I had 2 64 Lemans convertibles, a SS 396 w 4 speed Nova, a 65 Coronet w 383 and a 65 Lemans 2 dr ht. They sold them cheap back then, I got as many as I could on a custodian paycheck. I'm just so glad to have had the opportunity while I was young. The recycler paper was my go to source. What a great time. I remember the recycler-type papers. My dad and I would flip through them often. He had accumulated up to 14 GTOs (he is down to a manageable 3 or 4 now) plus other odds and ends like VW, Triumph, Porsche, Mustang, the list could go on....What a cool time if you were a car nut. The world was what you made of it back then. My buddies were into Hobby Stock & Figure 8 racing at Saugus. They would run mid to late 50s cars like 57 Chevie, Buicks, Fords. They had garages full of fenders, doors, bumpers, etc. They took convertibles, welded hardtop roofs on them for the heavier frames (lower center of gravity), they only used 2 door vehicles. One guy like 58 Edsel front ends and put them on 57-58 Fords and destroyed them every Saturday. People didn't want older cars then, they were easy pickins and super cheap. I think I paid $150 for that GTO without an engine/trans. It had the ladder bars, Rocket wheels and tires. It came as you see it and I put in a FREE 350 sbc/350 turbo trans and sold it a few years later for $1,200. 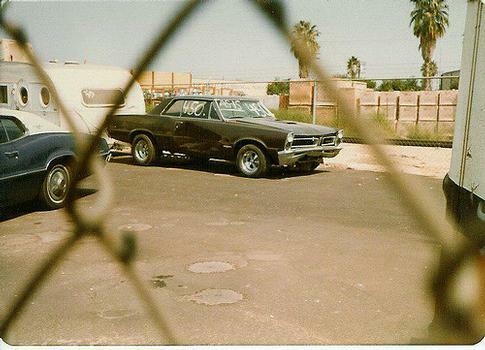 I bought a 66 Fairlane GT at a car lot in like 75, near Van Nuys Airport for $450. 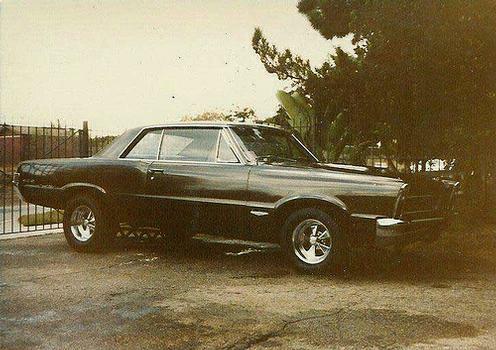 It was a 390, 4 speed (a top loader), 390 posi with Cragars & L-60 on back, it had the wildest custom paint job, what a force that beast was. It started leaking water from the rear freeze plug after the shifter broke off, ( I welded a bolt to a plate to fix it) I got mad and sold it 6 months later in the Recycler for $450. I can't imagine what it would be worth today.